I have purchased a new Garmin echoMap 50dv for my 2014 Oasis. I wanted to get my hands on the DownVu All-In-One transducer before I made a mounting decision. I feel that mounting it from one of the live well scupper holes would require the transducer to hang too low, exposing it too much to unintentional groundings, etc. I haven't ruled this location out, however, I'm also looking at the next obvious option which would be an in-hull solution. Has anyone attempted an in-hull mounting of transducer with this technology? Beyond the obvious inaccurate/un-usable water temperature readings, does this mounting location limit the higher resolution of the DownVu system? Any information would be great! ............... Se non lo sai ........... sallo !!!! 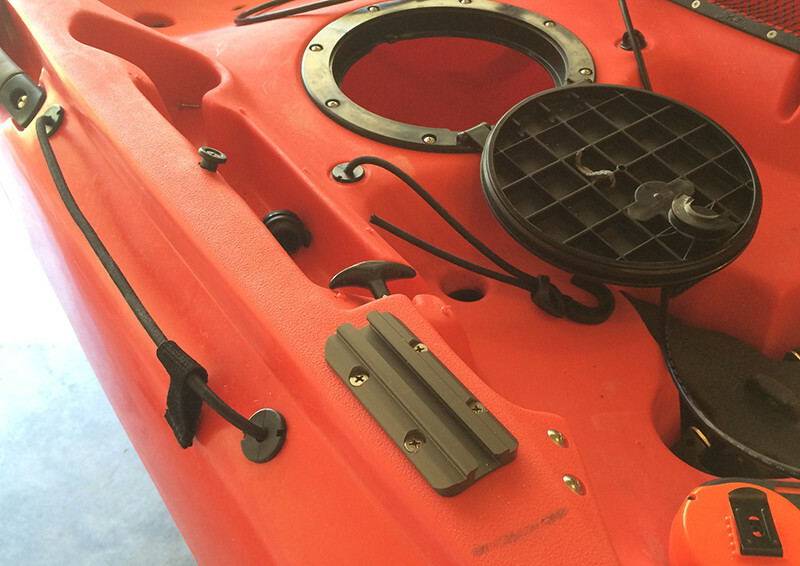 That's pretty slick and should work really well on the kayaks with the transducer mounting plate. Unfortunately, I don't have that option on my Oasis. I'm sorry, I was wrong to read ............ I understood Outback. I mounted mine (Garmin also) thru-hull and it works fine. Although these 3-D down view transducers aren't supposed to work well in shoot through the hull installations, the thin layer of hull plastic isn't quite the impediment that a foam core glass hull would offer. You should be fine. Just an update on this topic. 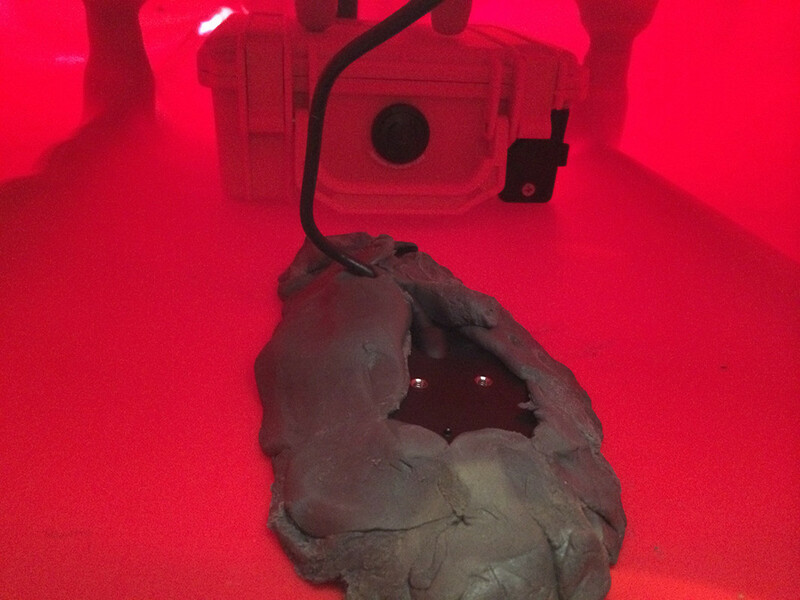 I was able to successfully install my echoMAP 50dv in my Oasis with the DownVu transducer INSIDE the hull. First, the install. 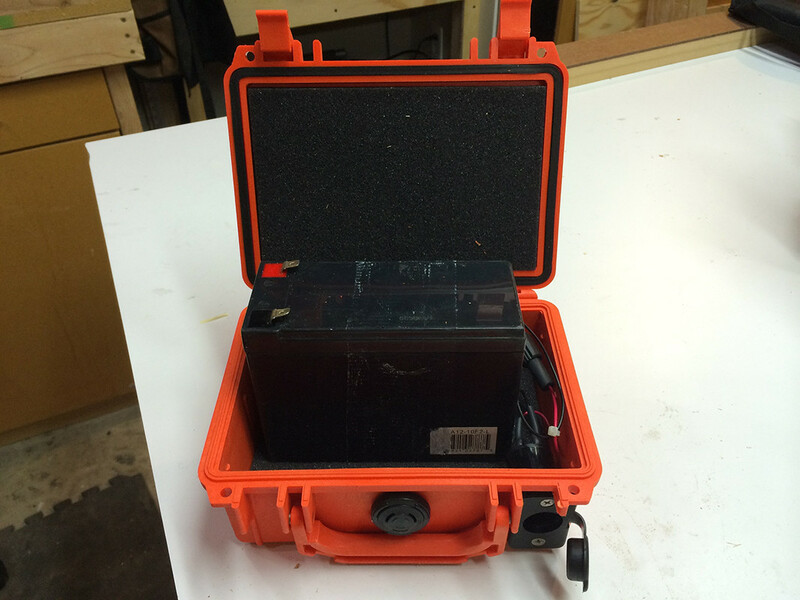 I loosely based my solution off this post taking the battery box idea and modifying it slightly. 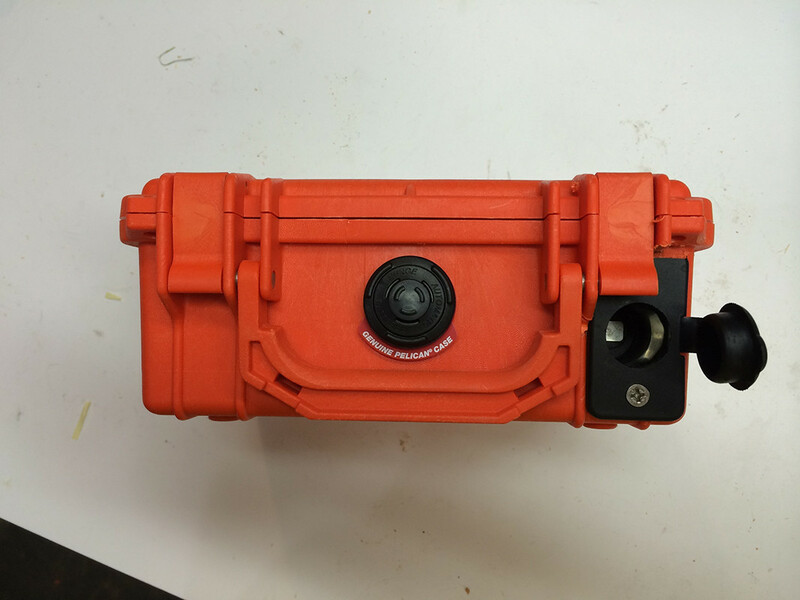 I purchased a "cigarette lighter" style, 12-volt DC connector from Bass Pro Shops for about $20 and then drilled a 1-inch hold into the front of a Pelican 1120 case that I had purchased on Amazon (the orange color was cheaper) to install it. I then cut the Garmin 8-pin power connector before the attached fuse and installed some blade connectors for connecting to the battery. The other end of the power cable was spliced/soldered to the male end of the "cigarette lighter" connector. 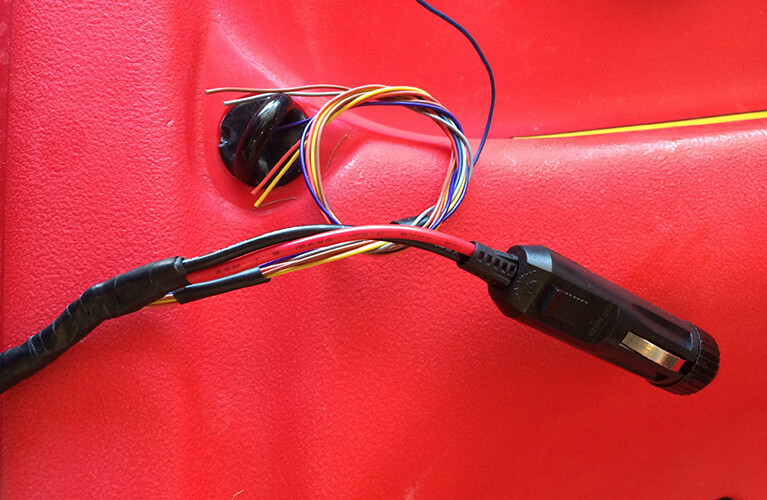 This photo was taken before I cleaned up the remaining six wires that come with the Garmin power cable. The transducer was installed under the front seat, roughly in between the two Mirage Drives, using duct seal. 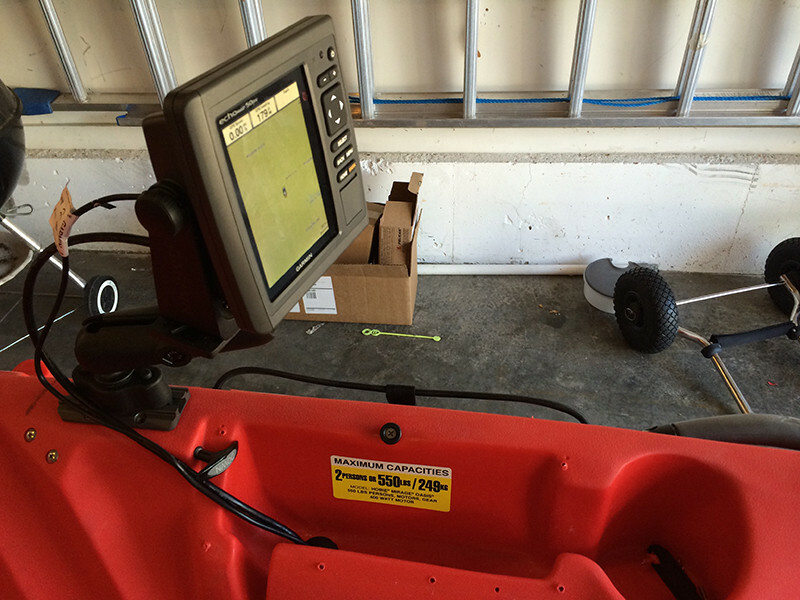 The battery box was placed just behind the transducer, to be bungied around the front seat scuppers. NOTE: It gets pretty tight in here once the transducer is installed. I found this out the hard way AFTER I installed the transducer. However, it is still possible to move the battery box in and out of the hull with the transducer attached. After some on-the-water troubleshooting, I found that I had sealed around the transducer TOO well not allowing any water to get down to the tranducer itself. I shut off the fish finder, manipulated the duct seal a bit more which allowed for a tad more space between the unit and the sealant, poured a bit more water on the combo, started the fish finder back up and viola! Initial observations reveal very good reception through the Hobie hull. The deepest water that I encountered on the first outing was around 30 feet which still yielded great structure detail and fish returns. 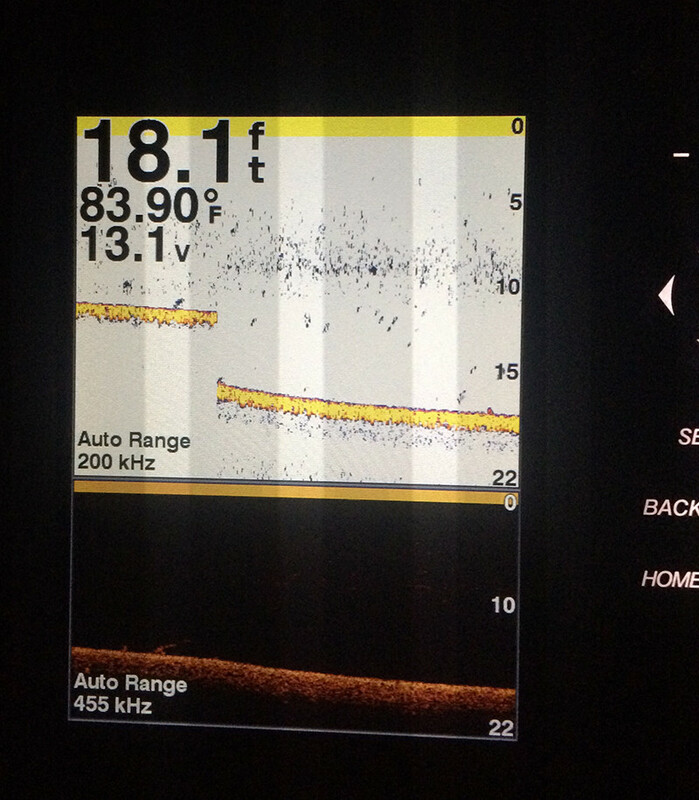 I am new to fish finders overall so I will admit that I do not have much of a basis for comparison. However, I will continue tweaking the install and setups on the unit and try and update this post as needed. 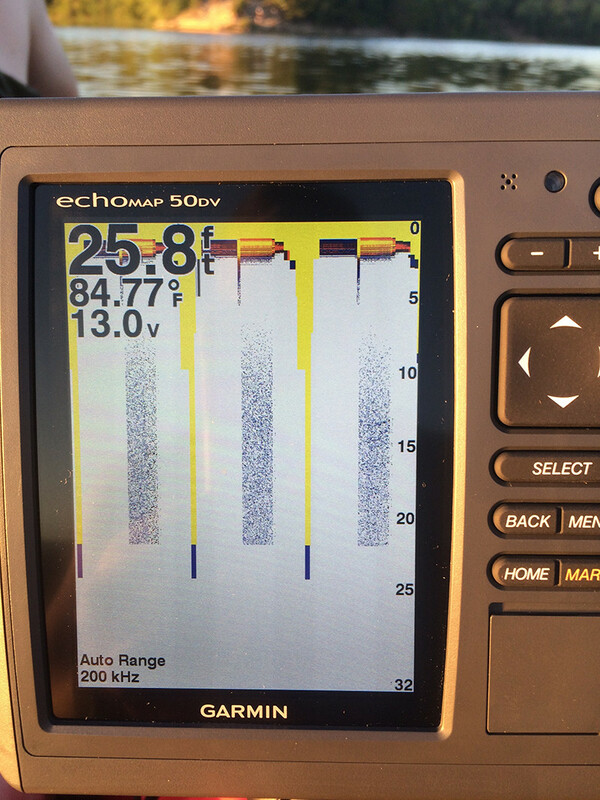 TriggerFish do you still have good results with your thru-hull transducer mount with duct seal? I'm looking to get s Lowrance hook 4 or 5 and will be using the thru- hull mounting as well. Forget the question, I see you had to loosen the duct seal. Are you tossing water on the transducer ? The duct seal looks like it's set pretty tight. Hey trigger fish where did you get that mount/bracket for the unit?